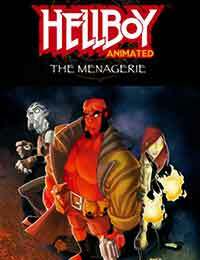 Hellboy Animated: The Menagerie Average 0.00/5 - out of 0 total votes. In The Menagerie, written by Jason Hall (Beware the Creeper,Pistolwhip) and drawn by Rick Lacy (Venture Brothers), a dull trip to a conference turns into a deadly adventure when a mythical menagerie from ancient Europe appears in the Amazon rainforest. Writer Nate Piekos (Atland) and artist Fabio Laguna (X-Men Unlimited) teach Abe Sapien a valuable lesson about silver lining in Small Victories.